I can’t believe the furore over the claims that certain tabloid journalists engaged in what has been ludicrously termed as “phone hacking”. It has even led to the resignation of Andy Coulson, the now ex-Director of Communications at No.10. Labour deputy leader Harriet Harman, speaking on Sky News, said: “Hacking into people’s phones is illegal. Obviously the criminal law has got to be complied with and if it is broken then it should be investigated by the police and it should be enforced. Gordon Brown has asked the police to investigate whether he was the victim of phone hacking, The Independent on Sunday has learnt. Mr Brown has written at least one letter to the Metropolitan Police over concerns that his phone was targeted when he was Chancellor, during the latter stages of Andy Coulson’s reign as editor of the News of the World. Mr Brown and Mr Blair are the most senior political figures to be linked to the phone-hacking scandal. In September, The IoS revealed that Lord Mandelson’s mobile-phone details and an invoice for research on him were among files seized by police investigating illegal activity by NoW reporters when Mr Coulson was editor. Other Labour figures understood to have been targeted include Lord Prescott, David Blunkett, Tessa Jowell and Chris Bryant. Now let’s be clear about what this “phone hacking” actually means. When you setup your mobile account you are generally provided with a voicemail service by your mobile operator. You normally press the voicemail button or dial the voicemail service to listen to your messages, but there is also usually another number you can dial from any phone which allows you to listen to your messages if you don’t have your mobile handset with you. Obviously when you call from another phone the voicemail service needs to authenticate you in some way, so it does this by asking you to input your secret PIN, much in the same way that you enter your secret PIN when you withdraw cash from a cash machine. 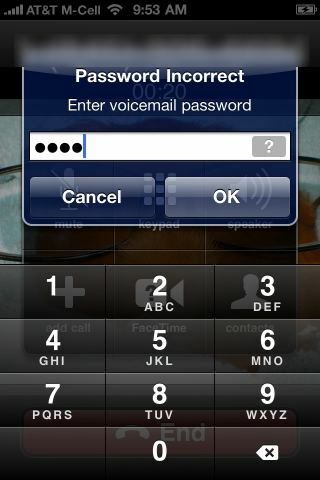 The mobile networks have a default PIN for voicemail accounts and you are prompted to change it the first time you use the voicemail service. Now if you elect not to change your PIN and leave it as the default code, then anyone will be able to listen to your messages. THIS IS NOT HACKING! Hacking would imply something more involved than simply knowing a persons mobile number and the default voicemail PINs of the UK mobile networks. The idiot ‘victims’ of this voicemail story should be embarrassed more than anything else. Anyone who is stupid enough to leave their voicemail PIN on the default setting without changing it to something secret is an imbecile, particularly those in the public eye who have something to hide. This entry was posted in General, Politics, Rant, Scams, Security and tagged 1111, 1210, 3333, 7890, 8705, 901, Andy Coulson, Phone hacking, PIN, voicemail by djh. Bookmark the permalink.